In stock 130 items in stock. 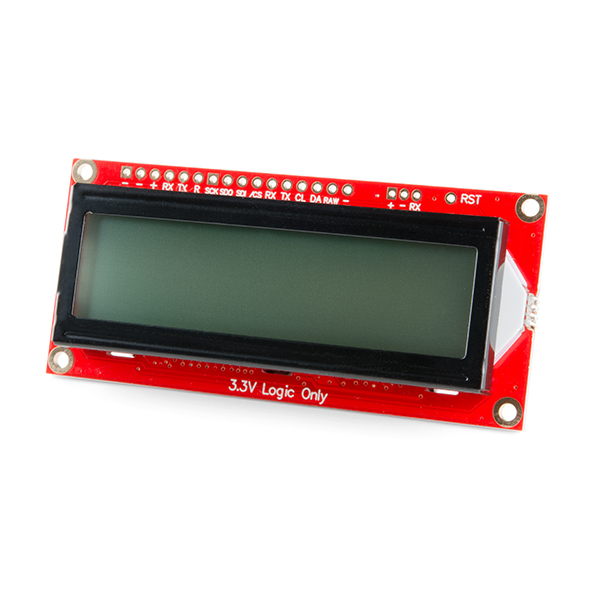 The AVR-based Serial Enabled LCDs are a simple and cost effective solution to include in your project. These screens are based on the HD44780 controller, and include ATmega328P with an Arduino compatible bootloader. They accept control commands via Serial, I2C and SPI. In this tutorial, we will show examples of a simple setup and go through each communication option. You can find a user contributed Eagle library for this part here! 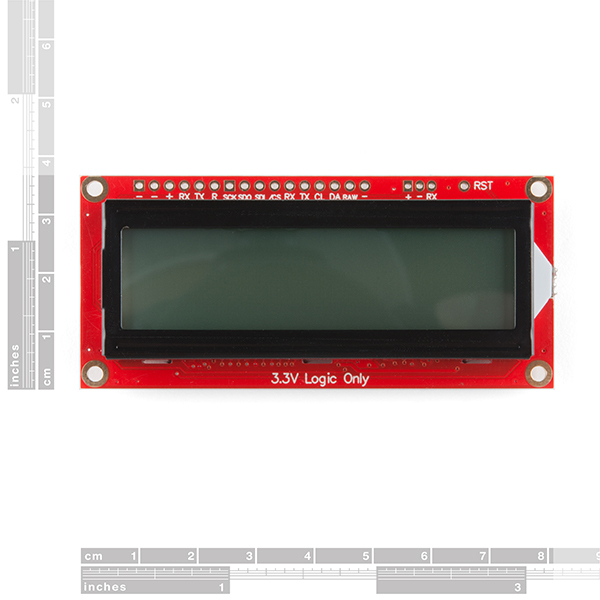 You can find a basic mechanical drawing for this LCD here. where is the CAD model? I'm confused. Since all interfacing is done via an ATMega328, why would this device be harmed by 5V? If the ATMega328 is running at 3.3V anything above that is technically out of spec and can cause harm. 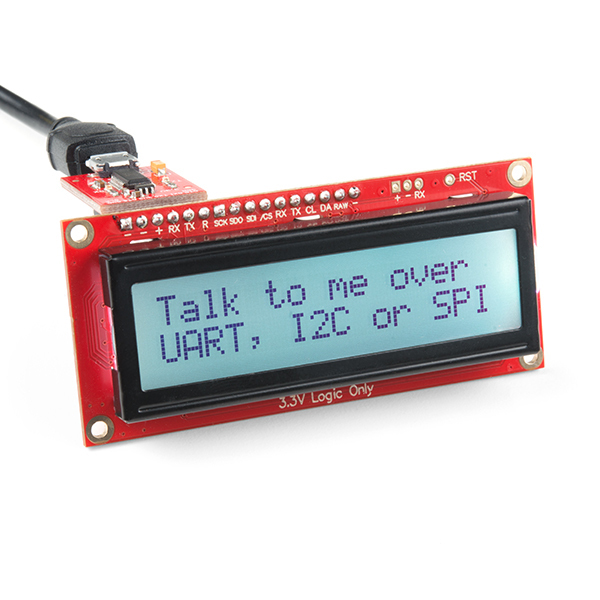 But I think the bigger issue is that the LCD needs to be powered at 3.3V. In other words use voltages above 3.3V at your own risk. Hey M-Short, Thanks for chiming in here, but just to be clear, these can be powered safely from 3.3V up to 9V on the "RAW" power input pin. The data lines (RX, TX, SDA, SCL, etc.) should all be talking 3.3V logic. It is important to note that the "+" pin on the FTDI header, is actually the VCC for the chip, and is supplied downstream from a 3.3V voltage regulator, so that pin should definitely never see above 3.3V. The hardware overview has more info, and the pinout graphic is a nice reference. Thanks! 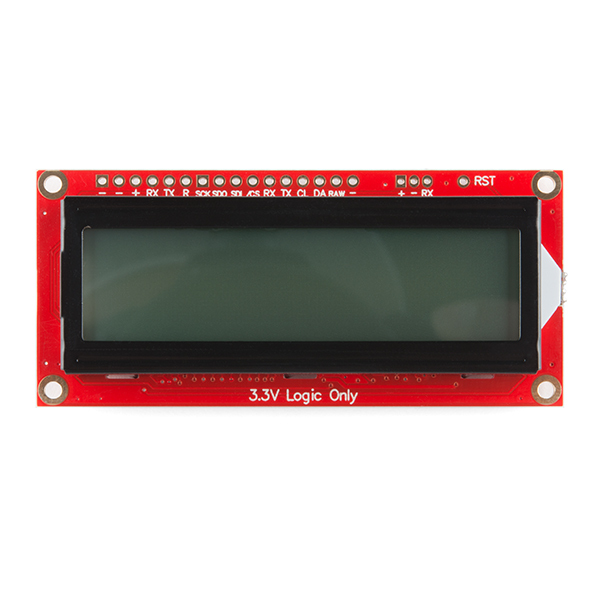 I was looking for simple LCD option that was 3.3V I/O compatible and would operate off of some very simple I2C commands. 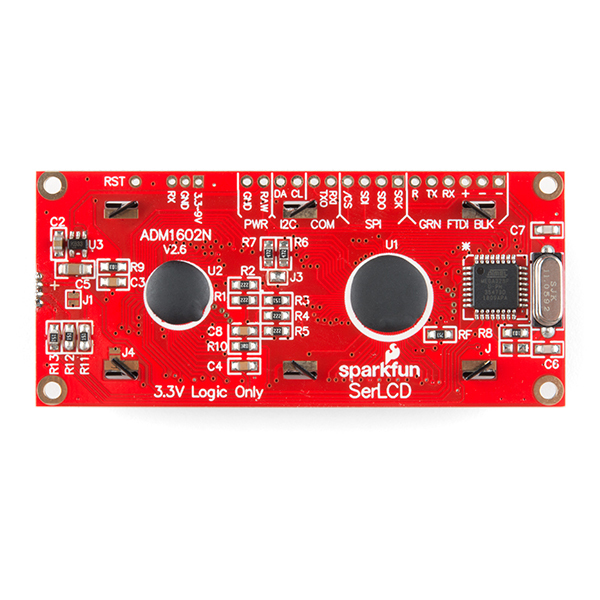 The beauty of this product is the simplicity of hooking it up to a 3.3V compliant Arduino device using I2C for communication. Well designed, and easy to use. Recommend it for any Arduino based project where you want to display some status or information. Works as advertised, and I was able to cook up a lightweight Python driver with smbus2 for use with RPi. I occasionally observe a garbled chars on the screen, combined with a Python IOError, but haven't yet taken the time with the logic analyzer in attempt to find who is at fault. The product is lacking a bit of documentation however. Notably, there is no mechanical drawing I could find (the 16-pin header is 0.100", sure, but what about size, and location of mounting holes, size of LCD module, etc.). A small oversight for an otherwise good board. EDIT: (I would reduce rating to 3/5 if possible). I purchased 2 of these units through DigiKey (ease of BOM mgmt for large proj), and am disappointed to find that the DK units do not have the recent firmware on them (as evidenced by inability to query firmware version and control backlight color via 0-255 RGB values - which according to GitHub were not present in earlier firmware versions). I attempted to re-flash via FTDI, but the Arduino IDE couldn't complete comms, so I'm guessing the earlier pieces of hardware that were bulk shipped to DK for resale do not have a bootloader. I'm confidant in my setup, as I was able to successfully flash v1.3 firmware to the unit that I ordered directly from Sparkfun. 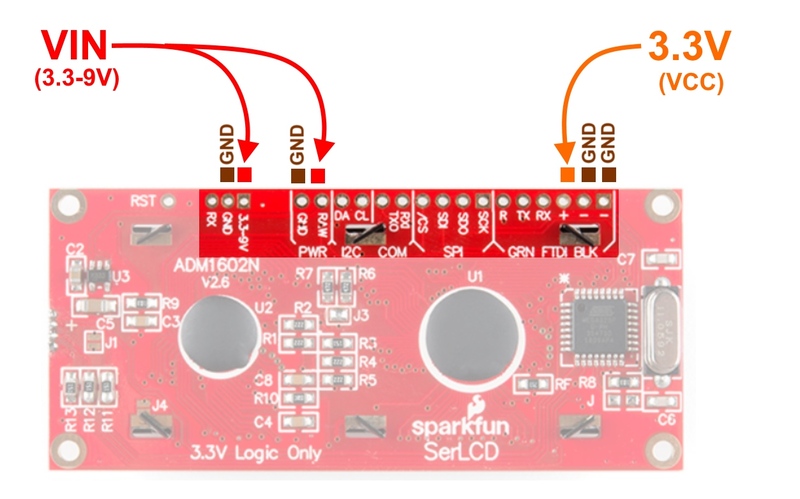 Additionally, the units from DK have 4.7k I2C pullups, whereas the unit I purchased from Sparkfun had them removed (not DNP, as evidenced by solder on the ENIG pads).